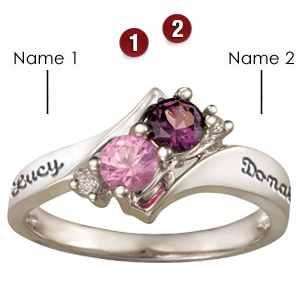 The Amoret ring combines your choice of engraving and birthstones. This versatile style can be worn as a promise ring or as a mother's ring. Select a birthstone color for each 4mm birthstone. Engrave up to 10 characters in each of two engraving areas. Two 1.5mm side accent cubic zirconia stones.